Life, Laughter and Paris: M. Aznavour S.V.P. My husband always jokes that Charles Aznavour must think I'm stalking him. I don't think I've missed any of his Montréal concerts since the 1970's (and there have been a lot of them)! Front row? You bet! But that wasn't enough. There was the time he performed in Ottawa and really, that's only a two hour drive from home so we went to that concert. And he was playing in Lille (near the border of Belgium). Well, we were in France anyway so what's a little detour north? And then he was at the Palais des Congres in Paris. Well duh! Aznavour in PARIS! How could I miss that? 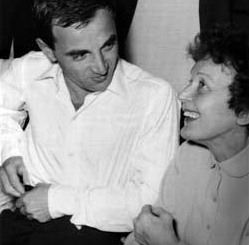 Now you may think this is weird behaviour, but to me, Aznavour is the personification of Paris. Aznavour.....Paris. Same thing. To hear Aznavour sing is like sitting on the Champs Elysées drinking in the atmosphere. Aznavour is a professional and seems to have respect for his audience. The first time I met him (yes MET him), he was at Place des Arts in Montréal. I was buying a poster after the show and the saleslady told me to wait, he'd be signing autographs. We waited. Unfortunately, it was all too much for me and I froze. My husband piped up, "she's your biggest fan". Aznavour signed my poster and we moved on. Again in Montréal at Place des Arts. He was at the stage door with a crowd of people around him. Lucky for me, I had had some surgery and was on crutches at the time so people stepped aside and let me through. I shook his hand, and said nothing. 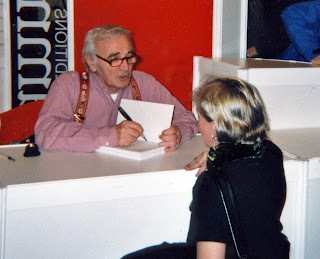 Several years back, Aznavour was in Montreal at the Salon Des Livres to promote his latest book. My sister and I sat in line waiting waiting waiting. Finally - my turn!!!! 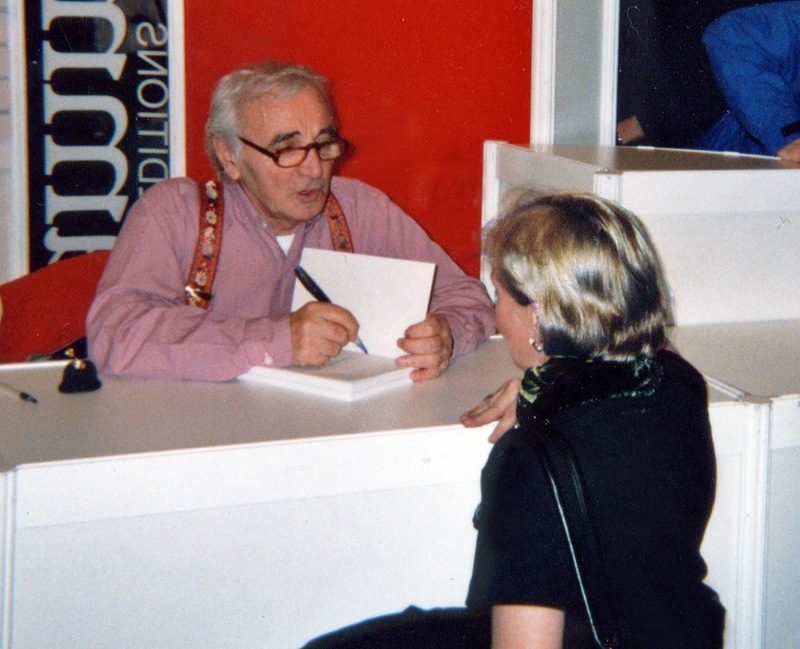 He was autographing copies so he asked my name....."Suzanne" I croaked. Then, he asked me (in English) if I could read French. "No, but it doesn't matter" was my oh so intelligent reply. The man is such a gentleman. I was backing away (like they do for the Queen) and he watched me and told me not to rush. ha ha ha. What an idiot I was! But, that's what happens when I'm so overwhelmed I don't know what I'm doing. Isn't it too bad we didn't have the chance to meet Piaf? But you met Chantal so that makes up for it! I have alaways loved Aznavour and I grew up with his lovely music. My favorite is La Boheme . I would immediately go to any of his concerts! Lucky You ! La Boheme is my favorite too! (I am lucky)! I recommend the concert DVDs - they're very well done. You'll feel like you're there!